How does Jaaxy compare to the Google Keyword Planner? 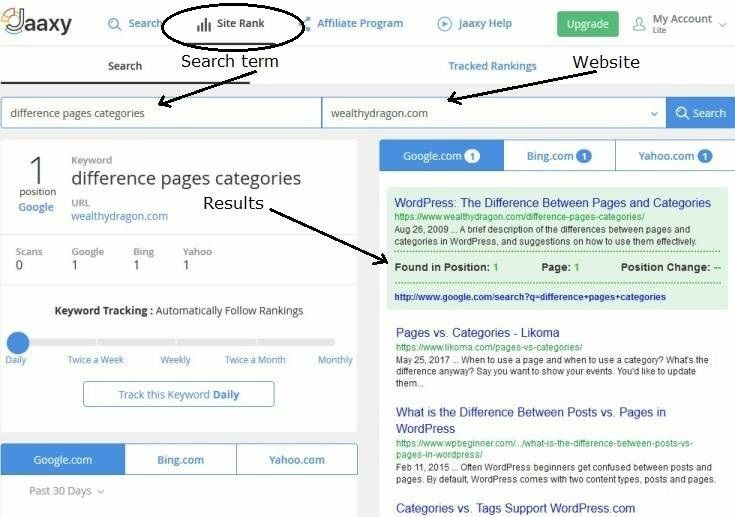 To beat your competition you need to figure higher in the search results than they do – and a powerful, fast, accurate keyword research tool, that finds and details the pages you would be competing with for your chosen keyword, is an indispensable part of your tool kit to do that. 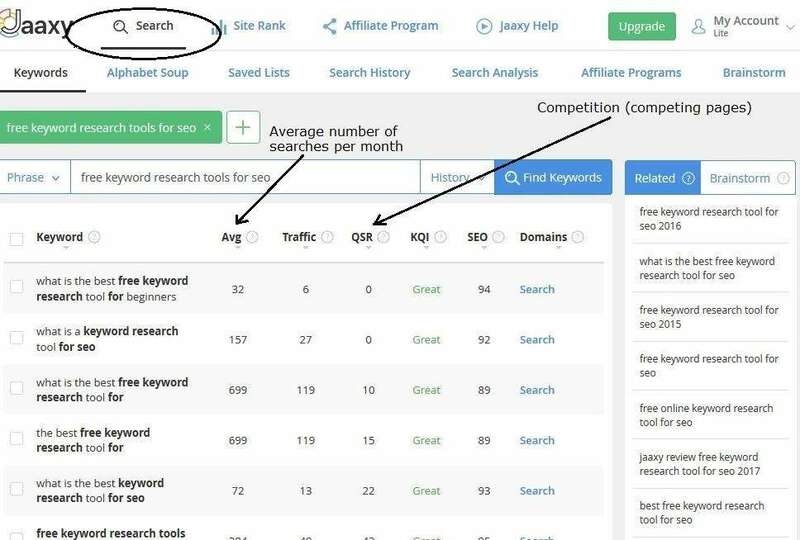 The Jaaxy keyword research tool gives you that competitive edge. What it is: A fast, powerful and accurate keyword tool, that finds and displays details of your competitors. It will give you the best chance of beating your competition in the search results. 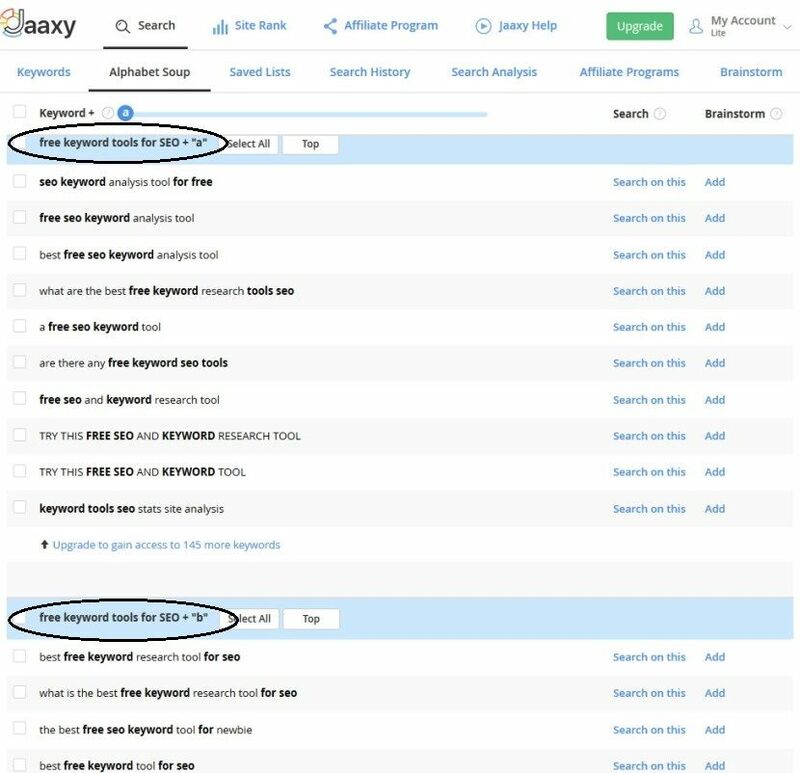 How does the Jaaxy keyword tool help? There are a number of keyword research tools, free and paid, out there. Also, I don’t want popular keywords, I want profitable keywords – where I’m competing for click-throughs with as few other pages as possible. There are more than 1.8 billion websites at the time of writing, and over 3.5 billion web searches a day. And many of those websites will have multiple pages that can be returned for the same search term. So how many pages can be returned for a single search term? When you’re trying to rank well in the search results, you do not want to be competing with 10 billion other results..!! What you do need is this: a search term that lots of people are searching for, that’s relevant to the information on your page, but for which there are as few competing results as possible. You’re far better off having 100 visitors a day, two of whom buy something, than 10,000 visitors a day who do not spend a dime. A good keyword research tool will help you find profitable keywords. For a long time I used the Google Keyword Tool (now called the Keyword Planner) to do my keyword research. I assumed that because it’s operated by Google it must be the most up-to-date and accurate of the keyword tools available. Logical, right? Unfortunately not – it rounds numbers, uses ‘buckets’ to group similar keywords, fails to return popular keywords, returns inconsistent combinations and un-related recommendations. There are a number of competing keyword tools available now that offer far greater accuracy along with additional analysis functions. These are a lot more useful than the Google Keyword Planner. The tool I now use is Jaaxy. So here’s how to use Jaaxy. They appear in the top menu, and each one is covered below. The Jaaxy feature I use most is the keyword research tool, found under the ‘Search’ menu item at the top. Apart from providing greater accuracy than the Google Keyword Planner, it also answers my questions about supply and demand – keyword profitability. You start by typing in a general keyword related to the subject of your article and Jaaxy will return a list of related keywords that have been used in recent searches. You want the number of competing pages (QSR) to be as low as possible and the average number of searches to be as high as possible. These are the two most important bits of information you need in order to find search terms that you can use as keywords, so you can rank as high as possible in the search results. They identify the profitability of each keyword. Once you have found the search term with the lowest number of competing sites and the highest number of searches, you can refine your search still further with the ‘Alphabet soup’ tool. This is a great way to find those really long tail keywords. Long tail keywords are where someone has typed a specific, detailed question into the search box. Although there is a lower number of long-tail keywords (than general keywords) the people typing them are serious and focused – exactly the kind of people who will convert better if the information on your page matches their search. Again, you want the keywords with the lowest number of competing sites and the highest number of searches. 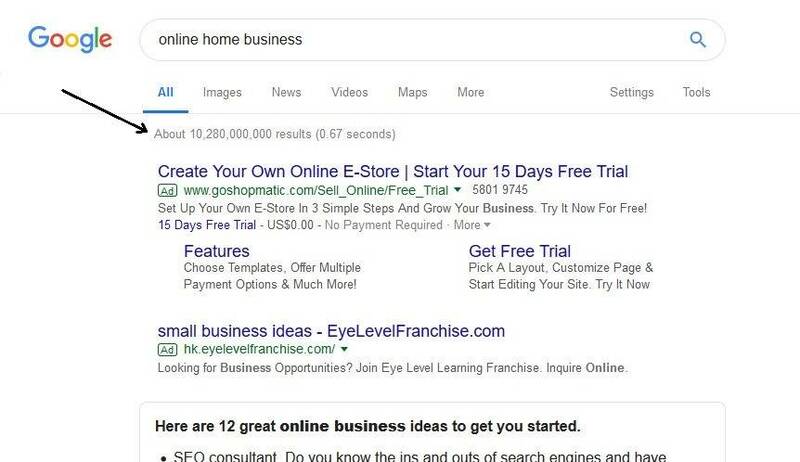 To do that, you simply click on the ‘Search on this’ link to the right of the keyword you’re considering and it takes you back to the screen where you can view competition and search volume. Long tail keywords are extra-long search phrases that have been used by searchers, for which Jaaxy will return a refined analysis of supply versus demand statistics, giving you an even better keyword to use. Search analysis – a listing of the current pages, along with detailed statistics and a link to each page, that are returned on page 1 on Google, Bing and Yahoo for any of the keywords you have chosen. This is a fantastic tool for taking a look at your competition to see what they are up to! The second major section (from the top menu) is the Site Rank section. This enables you to add your website and the keywords you have used in the past to see how your pages rank in the search results. You can see the current position of your page, and you can save it and track the performance to see how your page does over time. This tool tells you when you need to optimise your page in order to move further up the search results. Remember that optimising your page will encompass more than just updating keywords. The on-site factors that affect ranking is a different and wider subject, and I’ve addressed it elsewhere. This tool provides incredibly useful information when you’re getting a new web page established in the search results. If you’re writing content for the web and you want it to rank well in the search engines, I strongly urge you to take a look at Jaaxy. You can use it for free – and, if you’re not publishing too many articles a month, the free version does a great job. There are upgrade options for serious content marketers and an affiliate program that pays recurring commissions on a monthly basis. All members, including free members, are eligible for the affiliate program, so you can make money at the same time as improving the search results performance of your pages! P.S. While it may seem counter-intuitive to choose a different keyword tool over Google’s keyword Planner, I can only refer you to this article, that provides an in-depth review of the performance of Google’s tool.